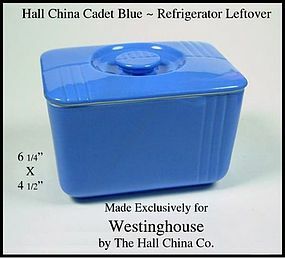 This blue Westinghouse covered refrigerator leftover was made by The Hall China Co. in the 1950's. This was part of the set that came with every new Westinghouse refrigerator. It is in excellent condition! 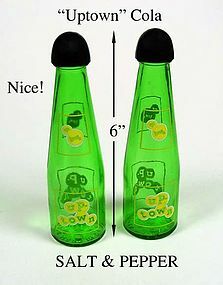 These UP TOWN pop bottle cola shakers were made by Owens Illinois Glass Co. They are in excellent condition! 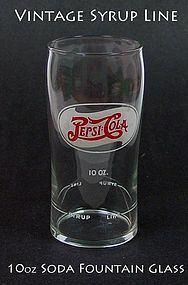 This 1940s-1950s Pepsi fountain glass / tumbler with syrup line, stands 4 1/2" tall and is 2 1/2" in diameter. It is in good condition with no damage, and no problems with the graphics. These were used in drug store soda fountains to measure the correct amount of Pepsi syrup to put in the glass. 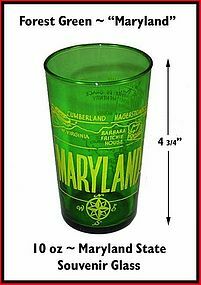 This forest green Maryland State souvenir glass has yellow lettering and was probably made by Hocking. All the points of interest are listed on the backside and it is very well done. 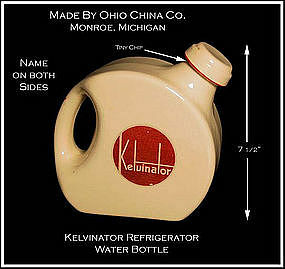 This Kelvinator Advertising Refrigerator Water Bottle was made by The Ohio China Co in Monroe Michigan in the 1940's. It is signed on the bottom. There is a small chip on the underside of the stopper under the red stripe. Very light crazing. Never saw this jug before. 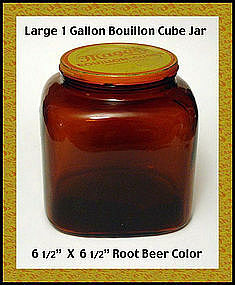 Large dark amber 1 gallon advertising jar. Lid marked in red letters "Maggi's Bouillon Cubes" Glass is excellent! We've never seen another jar like this. Slight fading in lid graphics. Marked O-I for Owens Illinois.